As the first cool fronts make their way down from the north and with the holidays right around the corner, the second major boating season gets underway on the Northern Gulf Coast. Flatboats and pirogues are readied and ponds in the marshes are scouted. Fishermen head out for those big reds and trout that got away over the summer, and the oystermen fan out from the coast to bring in those salty mollusks so necessary for this coast’s holiday celebrations. 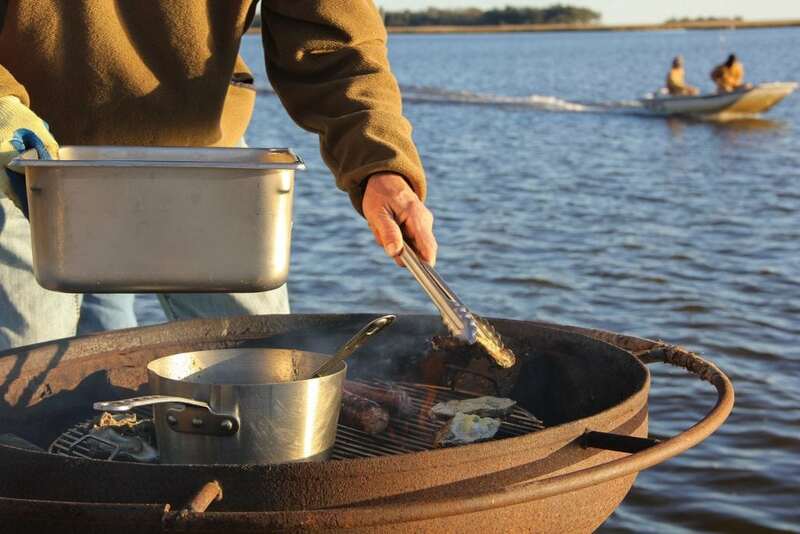 Thanksgiving and Christmas on the Gulf Coast have always featured time-honored traditions incorporating boating with holiday meals that reach back to subsistence fishing and hunting. It’s hard not to notice the flatboats covered in fresh marsh grass on Thanksgiving morning in New Orleans’ Garden District with hunters rushing in their camouflage gear to start the smokers. On the coast of Mississippi, boats skippered by “paw paws” and grandfathers are eased back onto their trailers as the proud and sleepy grandkids are ready for a nap from their quick morning of trawling for the day’s shrimp. On the bayous of Alabama, crab traps are raised and early morning trout are cleaned while the luggers in Apalachicola bring in those all-important oysters. As families descend on their gathering spots on the coast from Pass Christian to Bon Secour and from New Orleans to Clearwater, ladies in their kitchens and men at their culinary stations out back come alive. Recipes handed down from generations long past are shared with the next in line. The number of oysters in this year’s dressing is marked on the handwritten recipe that now scrolls back fifty years. Empty shotgun shell casings and old tangled fishing line are placed with moss, green mirlitons and heirloom crystal candleholder centerpieces, while laughter and the smell of redfish court-bouillon permeate the house. Out back, brothers and uncles sip on cold beer while their sons and daughters watch as ducks wrapped in bacon are smoked to perfection—the black labs wait for that one dropped bird. On piers and docks, oysters are charbroiled while a brisk cold wind whips down across the sounds and bays—boats pop in the water in a building chop while sailboat stanchions clink. Windows of the houses glow with the warm yellow light of families and friends gathered, their cars parked in the lawn underneath sprawling oaks next to a few boat trailers holding license plates from Louisiana, Mississippi, Alabama, and Florida. While the arriving winter means many cruisers across the country prepare to put their boats to bed under cover for the inevitable snow and ice, on the Gulf Coast and throughout the South, boating springs to life in a second season. Away from the summer waterskiing, regattas and the heat of waiting on that tuna to bite off shore, many might say that it’s the more important boating season.